Communicating with your Labrador puppy can be a bit of a minefield. 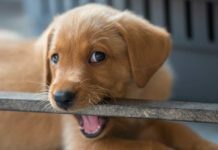 [wp_ad_camp_5]In this article we will help you to understand what your puppy is thinking, and how his communciation methods differ from your own. Usually in reference to a tiny little fluff ball, that has been in their home for all of three days. If you are confused because your commands are not working, you are not alone. 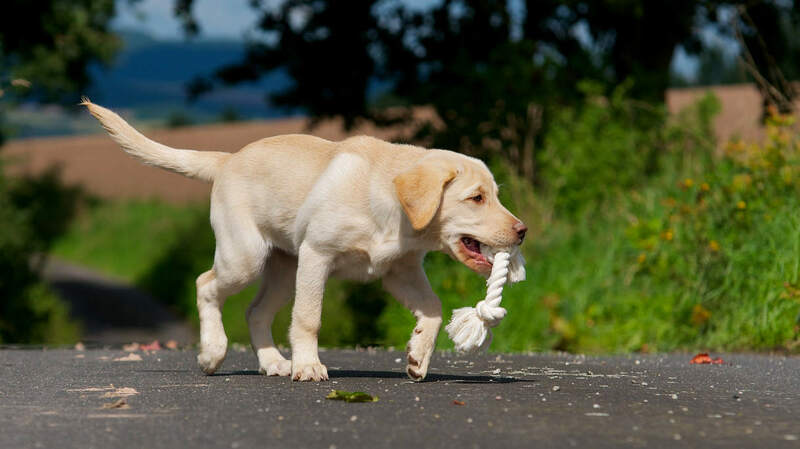 Many new Labrador puppy owners get very frustrated because it appears that their puppy is effectively ignoring them. And no-one likes to be ignored. In fact he doesn’t speak any kind of ‘human’ at all – everything you say is just ‘Blah, blah, blah” to him. Don’t panic, all that is going to change. But first, we need to consider just how puppies do communicate. Because for several weeks now, your puppy has been learning his own language. Not only do puppies not speak English, they are not ‘wired up’ to communicate through sound. A dog’s natural means of communication is through body language. Your puppy understands a whole catalogue of body shapes and signals that were used by his mother to let him know what is allowed, and what is not allowed. A language which tells your puppy what other dogs are thinking and feeling. And he instinctively gives bodily signals to other dogs, to help to keep him safe. Signals of appeasement and submission for example. Dogs offer these signals to people too, but they are often misinterpreted as signs of guilt, or being sly. “He knows he did wrong!” the exasperated owner will cry. Understanding your puppy’s body language is a great help because it enables you to adjust your behaviour so that he remains happy and confident. If you are aware of what scares your puppy and can recognise when he is feeling anxious, you can avoid giving off intimidating signals to your new friend. Of course, its all very well knowing when you are being scary and when you are not, but won’t you sometimes need to scare your puppy – just a little? Many new puppy owners are worried about discipline, and good behaviour. 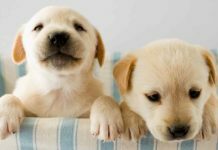 [wp_ad_camp_2]Won’t you end up with a spoilt and badly behaved puppy if you are too nice? Fortunately, we now know that it is entirely possible to train puppies without force or intimidation. Not only that, but happy puppies learn more quickly. This is simply because it is easy for his brain to process new information when he is not in a state of anxiety. Being kind is not the same as being permissive, you will still need to train your Labrador puppy to obey you, but you can do so without making him fearful. Of course, no-one sets out to frighten their puppy or undermine his confidence, but many people do so inadvertently. 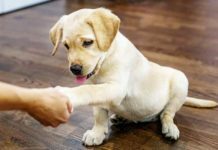 You and your puppy will both benefit if you have a basic understanding of what your puppy is trying to communicate to you through his language. And it isn’t always obvious. For example, many new puppy owners (and some experienced ones) think that a puppy is happy if his tail is wagging. But a fearful or uncertain puppy may wag his tail too. He will hold his tail very low, and wag just the tip. Watch the base of your puppy’s ears, and how their carriage changes, depending on how he is feeling. He will shift them back on his head if he is worried. A scared puppy may tuck his tail between his legs, or freeze and refuse to move. A really frightened puppy may flatten his whole body to the floor. Growling in puppies is often misconstrued and accompanies both play, and invitations to play. If your puppy sticks his bottom in the air with his elbows on the floor, he is inviting you to play with him, no matter how hard he is growling. Isolated from his mother and plonked in a strange new family that doesn’t speak ‘dog’, your puppy will not initially, be able to make much sense out of anything you say. 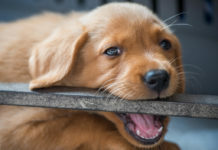 In families where puppies are often corrected or ‘disciplined’, a puppy will recognise signs of anger or irritation in his ‘grown ups’ from quite an early stage. But he won’t understand why they are annoyed, he will just want them to be happy with him again. It’s worth remembering that your new puppy isn’t fluent yet, in his own body language, never mind yours. Indeed, he may still misinterpret the language of older, strange dogs and you will need to protect him and supervise his interactions with new friends, just as you would your three year old child. Interestingly, over thousands of years of domestication, dogs have evolved quite an ability to understand human body language too. And will often naturally follow a human glance or gesture. With his natural ability to discriminate between small changes in posture and expression, your puppy may not understand much of what you say, but he will understand quite a lot of what you do. So if you point at something, he may go and look at it. If you turn away and pat your leg, he’ll follow you. If you run, he’ll chase you. And if you crouch down and offer him a wide armed welcome, he’ll run into your embrace. 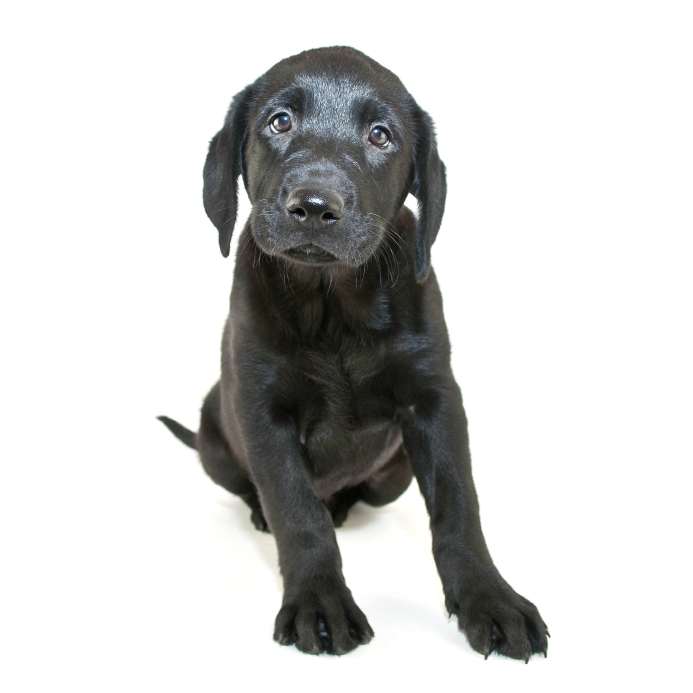 If you stare, look angry or stiffen your posture, your puppy may be afraid and cower. A direct gaze from one dog to another is considered threatening, but if you look at your puppy, relax, and smile, he’ll right look back at you. The human/canine bond over-riding his doggy instincts. You can use your understanding of your puppy’s language to make him feel at home. Being clued up on basic forms of communication like this, can really help you build a bond with your pup. It is very hard to communicate with anyone that is not interested in you, or that is afraid of you. So a big part of getting along with a puppy is about building that bond of affection and trust between you. This bond is built through physical contact and proximity, and through shared experiences, especially play, exercise, and most importantly training. Unlike children, puppies don’t soak up the English language just by being immersed in it. But whilst responding to verbal cues may not come naturally to a dog, thankfully, puppies can be taught to do it. Teaching a dog to respond to our verbal language is what dog training is all about. Training, and the relationship you build with your puppy through training, is the foundation of a strong bond and understanding between you. 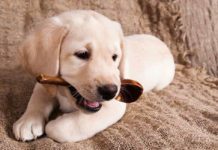 Because the bond between you and your puppy influences your training and vice versa, it is important to use positive reinforcement training methods on young puppies. And to remember that training takes time, often more time than new puppy owners recognise or are prepared for. So try to avoid rushing things. Your puppy is pretty smart but it is going to take him a few weeks to figure out what you want him to do. The reason for this is that a puppy has different strengths and weaknesses from humans when it comes to learning ability. [wp_ad_camp_1]Dogs are great discriminators and will notice tiny changes in your demeanour. But they are very poor at generalising. This means that when you teach your puppy what a word means in one place, he won’t necessarily understand what it means in another. For you to be able to communicate clearly with one another, you will have to ‘proof’ all the commands that you teach him, by re-teaching them in lots of different places. This is the most effective way of helping a puppy to learn, and of ensuring that he really does understand what you want. You can find out more in this puppy training section of the website. But remember, if your puppy doesn’t understand you, he isn’t being difficult, or naughty. He’s just being a puppy and he needs your help and support. The effort you put in now, will be rewarded a thousandfold in the future. So remember that he doesn’t speak English, be patient as you teach him, and above all, be friends with your puppy. 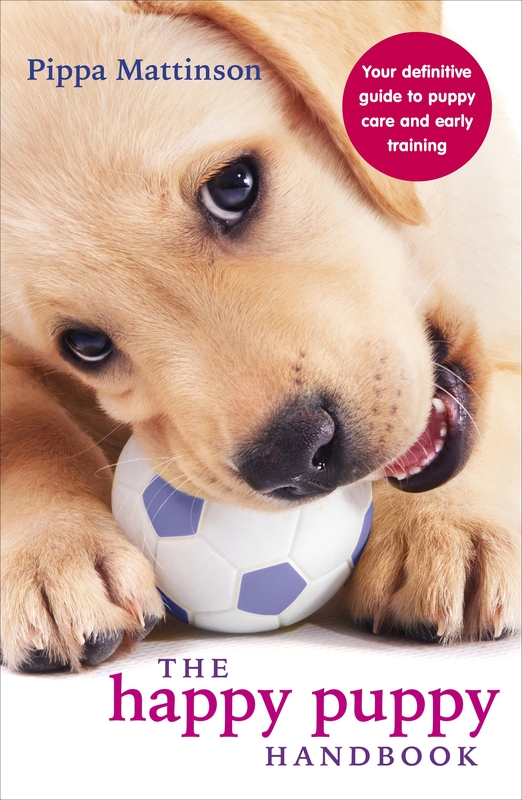 If you enjoy Pippa’s articles, you will love her new book: The Happy Puppy Handbook published in 2014. 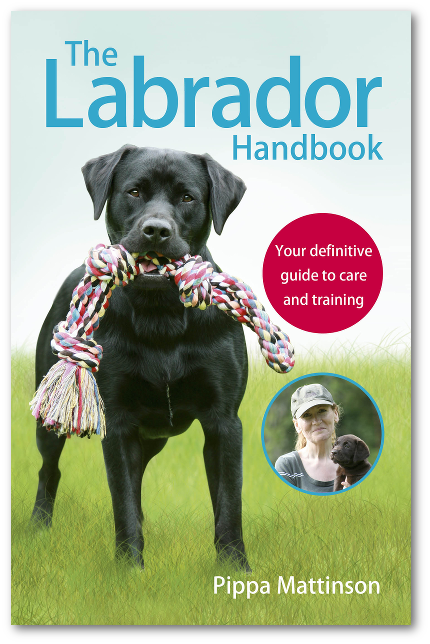 Now available in most countries, the handbook is already a bestseller in the UK. You can buy from Amazon using the links below. If you do, the labrador site will receive a small commission which is greatly appreciated and won’t affect the cost to you! 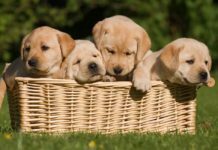 Next articleHow Much Exercise Does My Labrador Need? my puppy is three and a half.months old. he is always alot energetic as all labs are. but he always jumps n chew on clothes of every guest at home and he eats alot of rubbish. how can I help him with that? Keep things that can harm him, like rubbish picked up. Pick up your socks, and underpants, as these are a favorite of all Labs. Save yourself the trouble and simply keep things picked up. If you do this and he and goes seeking clothing, than take it away and say one word, NO firmly. That’s it. Each time. He will learn with your help.